Jupiter (you), is in it's own sign in the 12th house. Mercury (him/her) is in peregrine/detriment; also in the 12th house. Since you are both in the same sign; you either met recently or are thinking about each other all the time. He/she is thinking about you clammary but due to the detriment aspects; he/she could be having some doubts. Mercury sits right on the 1st house cusp; so he/she has control of whether the meeting occurs. 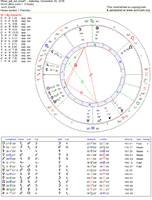 The Moon is the timing; Moon's next aspect is trine the antiscion of Venus (10th house ruler); maybe work commitments are getting in the way? These are just chart estimations, clammary; I would like to know more about the situation before making a decision. Thank you! I don't understand it much though, is that analysis for the same person in my past forum or anyone in general? No, this question is for you. I assume you are referencing the same person you asked about in the past; so this question is about whether you and (him?) will meet. Got it, thank you! Yes I want to know if we will meet. We have an upcoming event, I have not talked to him, we've been busy with different projects. Yes I've been thinking about him again. I have stopped doing that but for some reason I don't understand he's back on my mind. I found out we have the same exact life path numbers. master numbers. We seem like we were in the same place. clammary; well as I said; it work commitments could get in the way of the meeting. But there could be a scenario where you are both at an event and doesn't see each other? The chart I casted for you seems to suggest that you both seeing each other is possible. Is the event in the next month or two? Yes! why did you say this: But there could be a scenario where you are both at an event and doesn't see each other? Because that would be accurate, we were in the same event the other day, I did not see him but he was there. and have another event in a few weeks. Also, I have another question, with our synastry having double whammys and stuff would it be possible that I'm the only one feeling all that energy when I'm around him or since its DW and other aspects like venus-uranus the feelings (energies/chemistry) would be felt by both or just one person? thanks!! I suggested this because; I found in the horary chart of the question that he was in control of whether you met; and that work commitments likely got in the way of you both meeting. I knew you were going but the proximity of Mercury (him in this chart), to the ASC (you) was very close, but he was in the 12th house; not the 1st house. So I assumed you are both in the same building, area etc; but not quite face to face. Double whammies should be felt by both people; but yes aspects like Venus-Uranus can lead to one sided attraction. Sometimes aspects which people think are very compatible simply don't work out like that. For example; I have known several people with a Taurus Moon and despite that fact I have a Taurus Sun; I come to find them irritating because we are too alike. Is it possible that he saw me and I did not see him? is there any indication of that from the chart? if it's not too much to ask. When it gets to specifics like this; it is almost impossible to tell. Remember, despite it's accuracy; Astrology is a forecast, so you both have your own free will. If you haven't spoke to him since the event, how do you know that he didn't go looking for you? The chart only shows the pair of you roughly close (same area), but since Mercury travels fast than Jupiter; Mercury(him) has missed Jupiter(you). Hope this helps you clammary. Hi Sven! thank you again for this, yes it's helpful. Sorry I hope I'm not bothering you too much, can i ask a few more questions. You are Jupiter because you are the querent (the person asking the question), it doesn't consider Sun signs or anything to do with your natal chart. He is Mercury because he is the quesited (the person being asked about). The proximity of the planets indicates how close you were. Both planets (Mercury and Jupiter) were in Sagittarius and in the 12th house. The 12th house is said to be the house of hiding and secrets in horary astrology. It has a different meaning from standard astrology. I would admit I just learned about horary astrology from you.. I still have so much to learn!